IJOY EXO 360 kit consists of a 360W EXO 360 Box MOD and 5ml EXO XL sub ohm tank. EXO XL comes with XL-C2 and XL-C4 coils, but also compatible with other XL coils. 4 colors. EXO 360 Kit is a powerful yet compact vaping device from IJOY. The kit consists of 360W EX 360 Box MOD and 5ml EXO tank. The EXO 360 can reach up to 360W output power when powered by 4x 18650 cells or 220W power by 2x 18650 cells. 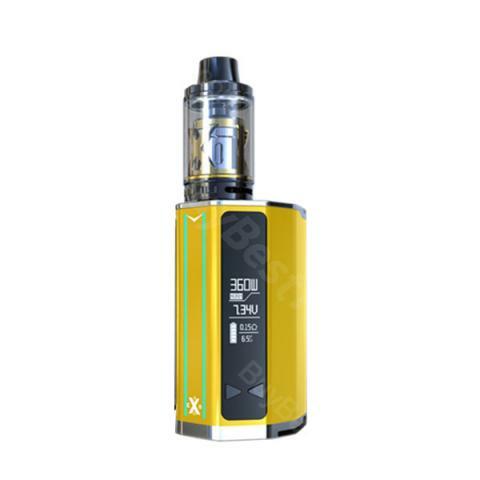 And the EXO XL is an improvement of limitless XL, which features an astounding working range of up to 215W, combined with 3 optional fully featured RTA decks, XL-1, XL-2, XL-2S. 4 colors. I find the batteries of IJOY EXO 360 Kit is adapted to the price and quality, the tank delivers pure flavor and no burns. Ich bin absolut begeistert von IJOY EXO 360. Lieferung ging recht schnell.Echt gut! klasse!